Home runs are some of the most exciting events in baseball. Everyone — even the most apathetic towards baseball — can appreciate a baseball that’s hit really hard and really far. But home runs are, compared to more mundane baseball events, pretty rare. During the 2011 regular season, batters hit 4,552 homers. That’s a seems like a lot. But considering the fact that about 700,000 pitches were thrown, home runs make up less than 1% of all pitches. It seems pretty likely then that our impressions about what is important in baseball are disproportionately affected by home runs. Command and control. They sound like terms we’d use during a military operation. But no, these are two skills that are very important in baseball. The two refer to the same general ability to throw pitches in the best locations for the pitcher. There is a distinction between the two. As I understand it, control represents the pitcher’s skill in throwing strikes; command refers to the pitcher’s ability to throw pitches where he intends to throw them. We can’t actually measure command. That would require knowing where the pitcher wants to throw the ball, and we don’t know that unless he’s telling us before each pitch. CommandF/X — Sportsvision’s technology that tracks the catcher’s glove — would help, but that’s not publicly available. 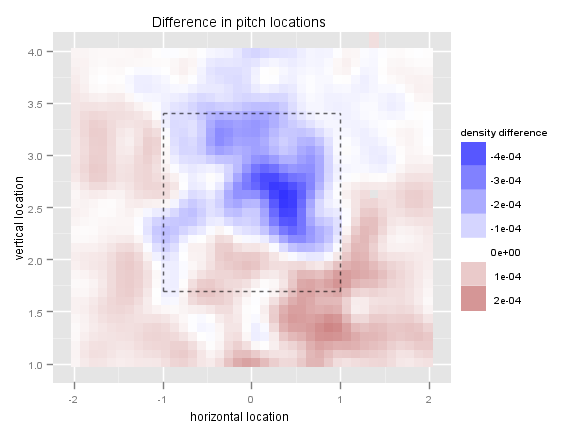 What we can do, though, is measure pitch location through PITCHf/x. This should work as a good proxy. We know that command is very important, and that the best pitchers, on the aggregate, display much better command than lesser pitchers. Pitching coaches have long extolled the virtues of getting ahead of batters. And while this advice is wise, it’s also usually given in ambiguous terms. Be aggressive. Attack the hitter. The general notion of commanding the zone and being aggressive isn’t hard to conceptualize, but it is difficult to state in concrete, quantitative terms. Statistics like K/PA and BB/PA tell us important information; after all, strikeouts and walks make up two of the three components of FIP. But they give us no insight into process of the at bat — they ignore everything except the result. And this is where pitch-type linear weights can help us. Linear weights measure the average change in run expectancy for a given event. For example, home runs increase run expectancy by an average of about 1.4 runs. But linear weights can be calculated in a pitch-by-pitch level, as well. Just as a single, double, triple or home run increases run expectancy; so does going from a 0-0 count to a 1-0 count, where batters perform better. Of course the run value of an additional ball is often small, but over the course of a season, these pitch-by-pitch run values add up. The Cubs need to prioritize. As a struggling franchise, they need to significantly overhaul their roster and farm system. A possible trade chip, as Buster Olney wrote last Monday, is Matt Garza. This year was excellent for Garza; to highlight a few of his achievements, he posted career bests in WAR, FIP-, and xFIP-. Much of his success can be traced to an improved strikeout rate. He struck out opposing batters 23.5% of the time, placing him right in between Roy Halladay and C.C. Sabathia for 12th among all qualified starters. In addition to an increased strikeout rate, we also know that he has been depending much more heavily on his off-speed and breaking stuff. Therefore we can attribute his great 2011 performance to his decreased usage of his fastball. A premier name in an uninspiring free agent class, Prince Fielder will make his money through his powerful bat. But matching his ability at the plate is his tremendous rotundity. This is a legitimate concern, as based on the careers of similarly bodied players Fielder does not project to age well. While teams would be correct to worry about his weight, they would be downright foolish to doubt his bat. Already elite at the plate, Fielder is fresh off his best offensive season, as measured by wRC+. Key to his success this past season was his improved plate discipline. While already talented in his plate approach, Fielder took last year to another level. As Dave Cameron observed earlier in the year, Fielder dramatically reduced his strikeout rate. But before we look at what Fielder is or isn’t doing differently, we need to recognize that there are two parts to the batter-pitcher match up. Perhaps obvious, but sometimes we credit all changes in walk and strikeout rates to the batter, without considering pitchers’ approaches. Perhaps the greatest right-handed hitter in the history of Major League Baseball, Albert Pujols inspires fear into the hearts of opposing pitchers and managers alike. In the past 10 years, he has led baseball in intentional walks, and not by a small margin either — he has 72 more intentional walks than second place (Vladimir Guerrero). This is not an insignificant sum. Because the value of an intentional walk is about a 10th of a run, Pujols’ 251 career intentional walks are equivalent to about 2.5 wins. That means on average, Pujols gains about 2.3 runs per season purely out of managerial fear. Pitching is a game of strategy. At any given time, a pitcher must consider the batter, the ballpark, the count, the strength of his pitches, his stamina and more. And there’s not always a correct answer — there might be multiple pitch combinations, locations and speeds, all with the same probability of success. Even when a pitcher has one plus-plus, unhittable, grade 80 pitch, they still need to know how and when to use it. One such pitcher is Zack Greinke. The owner of a nasty slider, the Brewers’ ace racks up strikeouts and swings-and-misses, thanks primarily to his slider. The pitch is dynamic: it doesn’t appear to suffer from platoon issues nearly as much as other sliders, which allows him to throw it both to left-handed and to right-handed batters. Indeed, the whiff rate (whiff/pitches) against his slider is actually higher against left-handed batters than against right-handed batters, albeit by a very marginal amount. I call it the Mariano Rivera rule. When explaining DIPS – the theory that all pitchers have very similar skill on balls in play – it helps to state the concept in terms of real pitchers. For most Joe Shmoes, we can expect a BABIP close to league average. Perhaps his BABIP won’t be average in a month, or a year, or maybe multiple years, but eventually we can expect it to approach around .290. But we know there are exceptions. If a pitcher allows very weak contact, he can allow fewer hits than expected on balls in play. And what pitcher allows weaker contact than Mariano Rivera? In over 1200 career innings, he has a BABIP of .262, which is well below the league average. If we assume that this number is an accurate representation of his true BABIP talent level, which it should be at this sample size, then we can reasonably say that any pitcher with a BABIP below or approaching .262 is at least partially lucky. Of course this is not meant to say that Rivera’s BABIP has some sort of asymptotic purpose in nature, just to suggest an easy rule with a high level of accuracy. Owner of a career .265 BABIP in over 1300 career innings, Matt Cain breaks this rule. While he pitches against easier competition in a more pitcher friendly ballpark, he is also a starter, forced to weave his way through multiple lineup turns with declining stamina. While his DIPS defying ways have been well documented, they remain fascinating. The slider is baseball’s hardest pitch to hit — at least when it comes from a guy like Sergio Santos. This season, the 28-year-old White Sox reliever has used his slide piece to rack up nearly 13 strikeouts per nine innings. And consider this: For every 100 sliders Santos throws, he racks up 34 swings and misses — the best in the major leagues for any pitch thrown at least 250 times. That’s also more than double the average rate for sliders. Even more incredible, out of every 100 swings against his sliders, batters miss 63 times — also the highest rate in baseball. That’s simply absurd.